Traditional Japanese Garden Design is based on some simple basic ideas and principles, however to master the art of this form of garden design many elements need to be considered. 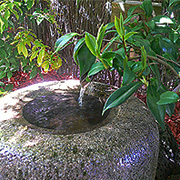 We provide a guide to the basic elements of designing a Japanese style garden. You need to consider the individual elements and ornaments within the garden itself as well as the broader garden design. 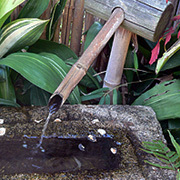 A simple japanese water bowl with bamboo water spout (picture right) can add instant appeal without great cost. Very popular in the UK, we are increasingly familiar with some of the names and styles but what is Japanese gardening all about, terms such as himorogi or 'divine screen' are used, but what do these mean? Himorogi actually refers to a Shinto Temple, these temples were screened, often by bamboo. Ishidoro are the name for the Japanese Stone Lanterns. Kakei is the bamboo water pipe. Sekimori-ishi is a small stone tied with black string, it represents a boundary in the garden where guests should not pass. Tobi-Ishi is the stepping stone. Karesansui gardens, which are the dry gardens are dominated by raked sand rocks. But what is this all about? Well the sand is said to represent the sea, and the raked patterns the waves. 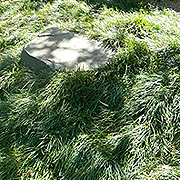 A place for meditation, often with a seat placed at a critical viewpoint. Tsukiyama gardens are a second and different style with Tsukiyama referring to the illusion created of a hill in the garden. Hills, ponds, bridges and trees characterize this style of garden, that is meant to represent nature. Streams and even lawns are incorporated into this style of garden. Hashibasami- no- ishi are the stones set as supports either side of the end of a bridge to symbolize strength. Ike are ponds or water features. Chaniwa gardens are a more formal style built for Tea ceremonies often surrounding a tea house. Chaniwa gardens are characterized by, stone lanterns, water basins or "tsukubai" placed for washing the hands and stepping stones leading to the tea house. The "tsukubai" is the lower water bowl, guests to the tea house needed to bend or kneel to wash their hands, this is to humble the guest before entering, a second style of water bowl is the "chozubachi" a taller bowl, these were set outside temples, again for hand washing. Tea gardens are also called Rojiniwa. So Japanese gardens are about the shapes you find in nature, no rectangular ponds in a Japanese Garden. If you are looking for an authentic Japanese Garden you would do well to consult a specialist landscape architect, however elements that create a Japanese feel to a garden can be added with careful planning. Pictured right is a sea of mondo grass surrounding a rock, certainly not the traditional japanese style, but the feeling is evident.